Aflac Childhood Cancer Campaign™ / Shop / Aflac Childhood Cancer Duck, 6"
This limited edition, Aflac Childhood Cancer Campaign duck makes a “super” addition to your plush collection. 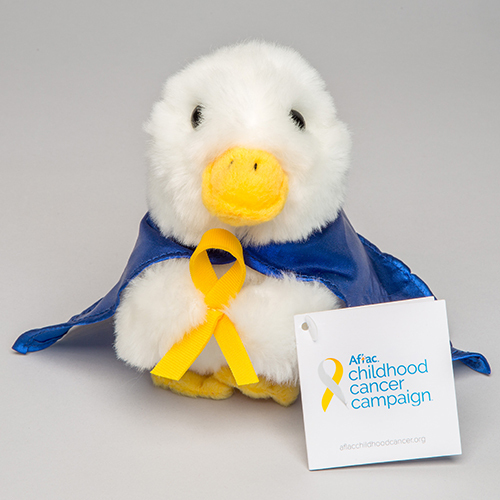 Wearing his superhero cape emblazoned with the Aflac Childhood Cancer Campaign logo, the six-inch duck holds a gold ribbon in honor of pediatric cancer awareness. Perfect for snuggling, this little duck loves to be hugged and quacks “Aflac” when squeezed. Constructed of top-quality plush materials for durability and softness.